Elizabeth Barrett’s poems have been widely published in magazines and anthologies. Her collections include Walking on Tiptoe (Staple, 1998), The Bat Detector (Wrecking Ball Press, 2005) and A Dart of Green and Blue (Arc Publications, 2010). One of Elizabeth’s key preoccupations, in these collections, is her life as carer of a severely disabled son. In her new manuscript, Fall, Elizabeth continues to explore the impact of motherhood on identity. Here, however, her subject is the sudden and unexplained disappearance of a daughter. 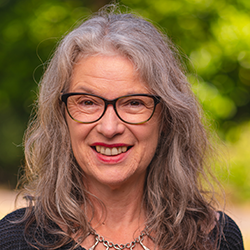 Elizabeth has worked as a creative writing tutor in adult and higher education and has been writer-in-residence in schools, community organisations, local radio and a prison. She has participated in cross-artform projects including collaborations with the painter John Brokenshire and the violist Robin Ireland, who composed original music to accompany the title sequence of poems from Elizabeth’s second collection, The Bat Detector. Between 2000 and 2005 Elizabeth was co-editor of Staple Magazine and in 2000 she was the recipient of an Arts Council of England Writer’s Award. Elizabeth lives in Sheffield where she works as a University Lecturer in Education. As well as a poet and educator, Elizabeth advocates for her autistic son. She blogs at: dylanandliz.wordpress.com.